The Fourth of July weekend rings in official summer, and marks many campgrounds with No Vacancy signs. Despite the recession, Americans will be on the move during this holiday in large numbers. Some of us will be staying closer to home than usual; but we're going camping nonetheless. 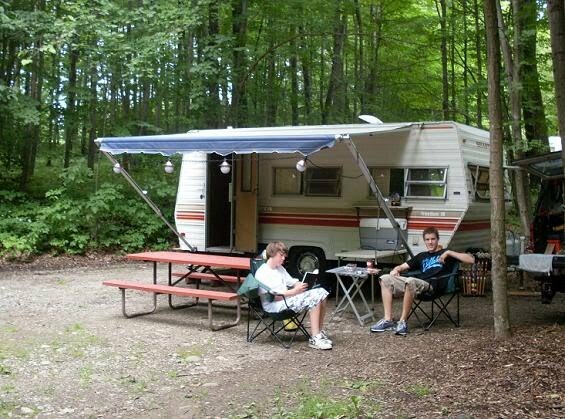 July 4th is also a popular time to put together groups of family and friends at adjoining campsites, since so many people schedule their vacations around the date. It's a dangerous time for driving, with traffic statistics showing a shocking spike in alcohol-related fatalities during the holiday. Smart campers know that drinking and driving never mix well; that's why they go camping -- so they don't have to leave after the party. 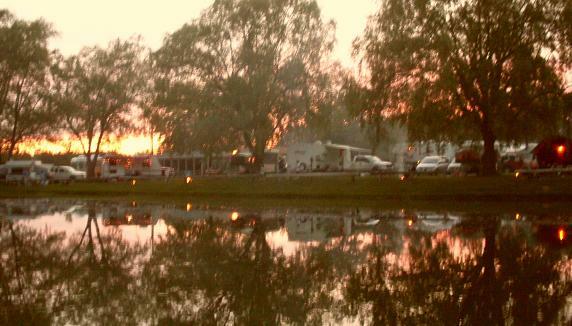 Even when you stay put, however, trouble can track you down at the campground. Here are ten tips for a safe holiday camping trip for you and your family. Check and re-check your vehicle and camper before you leave. Make sure your signal and brake lights are working, and that your hitch and braking system are ship-shape, if you're towing. Kick the tires and check air pressures, too, while you're at it. Blowouts while you're hauling a camp trailer or fifth wheel, or driving a big motorhome, can be disastrous. Carry a good first aid kit. Campgrounds don't always have medical help handy, especially at night; so bring your own. Bug bites, minor burns and sunburns, and small cuts are all easy to handle if you're prepared. Be careful with perishables. Most of us have experienced at least a minor case of food poisoning while camping. Don't risk it. Use double-insulated coolers and plenty of ice (or ice packs). Use your camper's refrigerator (if available) for foods that don't suffer heat well -- use coolers to store drinks and watermelons, not the mayonnaise. Keep a close eye on your dog. Crowded campgrounds and noisy kids make for nervous canines. Who needs the hassle of a dog bite incident when you're among strangers and miles from home? Keep your kids in check, too! Sugary soft drinks, too much junk food, and new friends at the rec center can lead to unpleasant results. We can't watch our little devils all the time, so be sure to set some limits. Use walkie-talkies to keep in touch with and check up on your wandering offspring. Remember you're playing with fire. 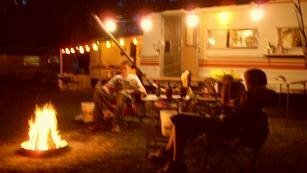 Nighttime at the campground is all about gathering around the campfire. It's a mesmerizing ritual we all take for granted. Don't use gasoline to jump-start your fire. Keep the burn within the fire ring, and don't compete with your neighbors for the "tallest flames" award. Airborne sparks can destroy tents and camp chairs, even hair! And don't leave your fire unattended; that's rude and dangerous. Should you drink the water? In theory, drinking water supplied by reputable campgrounds should be fine. In reality, water quality varies dramatically. 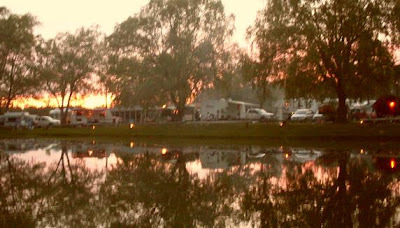 Most camping resorts are, by nature, in remote locations and rely on well water. Almost all non-municipal water contains an assortment of other "additives" -- most of them completely harmless. However, we vote for "better safe than sorry" and recommend BYOW. Beware of cheap fireworks. It doesn't have to be Independence Day at the campground for the low-grade fireworks to show up. Sparklers and bottle rockets are fairly tame, but can lead to trouble for smaller kids and for campers who've over-imbibed. Larger munitions can be far more dangerous. Be wary of strangers bearing explosives, and keep a tight leash on the teenagers after dark. "Hey, that kid has a knife!" All the cool kids do, apparently. Perhaps this is so they can set to whittlin' when they get bored, which seems to happen about two hours after you finish setting up camp. Regardless, be aware of whatever weaponry your own kids are toting; and warn them to be cautious around their new campground friends when the cutlery comes out. Know how to identify poison ivy. Bring 8 by 10 glossies if you have to. For whatever the reason, campgrounds always seem to have plenty of poison ivy on hand. If your kid is half as allergic as mine is, you know exactly how important this final safe camping tip really is. The best camping trips always end with the whole gang arriving home safe and sound. That way, the stories that begin "remember that time...?" can be funny ones, rather than horror stories. Save those for the late night campfire gatherings.